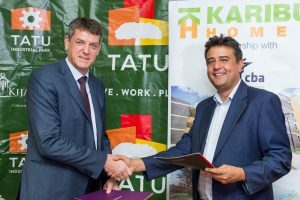 Karibu Homes, a leading developer of modern, inclusive communities in Kenya, has signed an agreement with Tatu City to enable it to develop over 1,000 affordable homes at the mixed-use, mixed-income development in Kiambu County, Kenya. Backed by US investment, the project’s cost will be in excess of USD 40 million and will provide increased opportunities for local employment in the area. Karibu Homes’ site, located right on the Kiambu Road, will have 1-3 bedroom apartments with 24-hour security and numerous amenities including basketball courts, a club house and shops. It will be similar in scope to other developments delivered by the company and bring current homes in planning or under construction at Tatu City to over 5,000.